Redfish, also known as red drum, is a firm, white-fleshed fish similar in texture and mild flavor to cod, haddock, pollock and striped bass. The sturdy fillets take to a variety of cooking methods, some of which aren't recommended for thinner varieties like sole or flounder. Whenever possible, choose redfish farmed in the United States, advises the Monterey Bay Aquarium Seafood Watch. These fish are raised in an environmentally friendly manner and have a low risk of contamination or parasites. Choose fillets that are at least 1-inch thick for broiling. 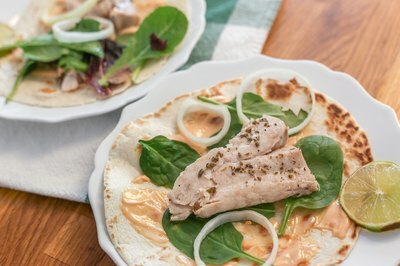 Place them on a broiler pan coated with a thin film of oil or nonstick spray. Brush each with a small amount of oil, and season with salt, pepper, herbs, spices or juices, such as lemon or lime juice. 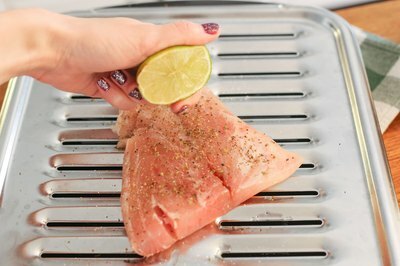 Position the fish 4 inches from the preheated broiler and allow it to cook until the fillets are browned and the thickest part is opaque in the middle. Allow eight to 10 minutes for every inch of thickness. For additional flavor, top cooked fillets with pesto or chunky marinara sauce. Coat a baking pan with nonstick cooking spray. Place the redfish fillets in the pan and roast them in an oven preheated to 450 degrees Fahrenheit for eight to 10 minutes per inch of thickness. To add fiber, vitamins and minerals, place thinly sliced vegetables -- such as mushrooms, chopped onions, peppers, carrots or zucchini -- in an even layer under the redfish fillets before roasting. Pre-steam harder, thicker vegetables like potatoes or broccoli before roasting them with the fish. To poach redfish fillets, choose from water, seafood or vegetable stock, wine, tomato sauce, juice or a combination of any of these. 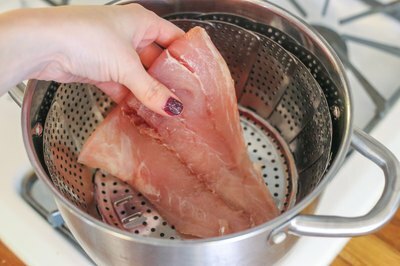 Fill a large skillet with enough liquid to cover the fillets. Turn the heat to medium and bring the liquid and fish to a simmer. 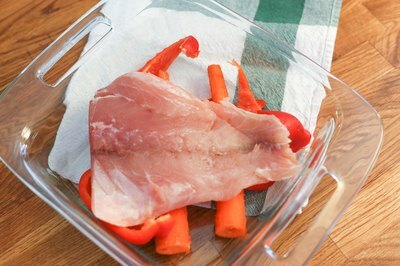 Allow the fish to cook for eight to 10 minutes, or until the thickest part flakes easily and is opaque in the center. 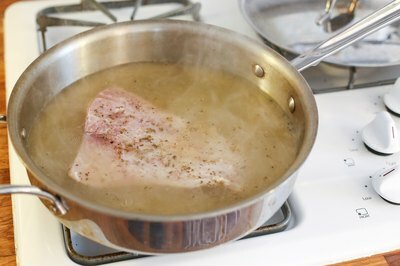 To boost the flavor, sauté chopped onions, garlic and herbs in the skillet before starting the poaching process. Put approximately 1 inch of liquid in the bottom of a commercial or Asian bamboo steamer -- use water, broth, wine, juice or a combination. Turn up the heat to high so the liquid comes to a boil. Put the steamer rack in place, position the fillets on the rack and cover the steamer. Cook for four to eight minutes, check for doneness, and remove or continue cooking until you don't feel resistance when inserting a thin knife into the fillet's thickest part, says food writer Mark Bittman. If you don't have a steamer, use a large pot with a tight-fitting lid and a rack that can fit inside.